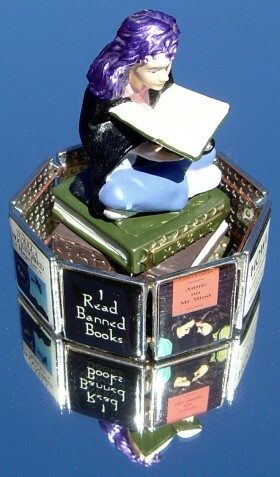 This “I Read Banned Books” bracelet was designed by Carolyn Forsman for the American Library Association Office of Intellectual Freedom, and in addition to the “I Read Banned Books” panel/charm features very shiny and pleasantly-smooth-to-the-touch reproductions of familiar covers of these seven frequently banned and challenged books: Alice’s Adventures in Wonderland, Annie on my Mind, The Color Purple, Go Ask Alice, Howl, Huckleberry Finn, and To Kill a Mockingbird. 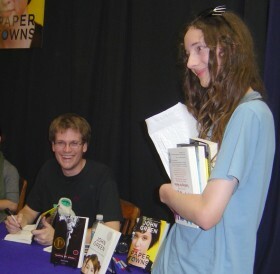 I got it at the notable independent bookstore Kepler’s Books when we were there to see John Green (one of my son Arthur’s favorite authors, as well as yet another author whose books have been banned and challenged) reading from his book Paper Towns. Kepler’s doesn’t sell the bracelet on their web site, but you can buy it on many other sites including Carolyn Forsman’s — she also makes a necklace version of it. There’s also a children’s-titles version — featuring The Adventures of Captain Underpants, Annie on My Mind, Athletic Shorts, Blubber, In the Night Kitchen, King & King, and To Kill A Mockingbird — available in both child and adult wrist sizes. As with my Harry Potter Hogwarts House wristbands from the Deathly Hallows book release, I wear this bracelet to library, book, bookstore, and other literary events, plus for Banned Books Week. The bracelet picture at the top of this blog entry features a little Hermione statue I had gotten many years ago (and painted her hair purple to match my own), sitting in the sunlight on a fancy mirror I use as a serving tray for bread. As shown here I also used her to make a “Books not Bombs” image that I use as my user/profile icon/picture on some social-networking web sites. And if you’ve read Harry Potter and the Deathly Hallows you know that Hermione does read banned books — Harry and friends wouldn’t have been able to defeat Voldemort if Hermione hadn’t “borrowed” and read the Horcrux books Dumbledore had removed from the library and stored in his office. Nice! The people banning books need to be banned. You’re welcome! I’ve definitely enjoyed the bracelet, and the pins look great! Next post: Love Your Body!